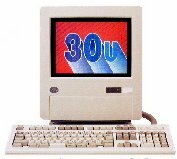 Model 5530 initially started as Low-Priced PC which was targeted to personal market. IBM Japan named the PC as " PS/55Z " to distinguish from PS/55 which was the main stream of MCA line targeted to business market. 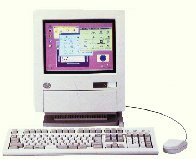 Before IBM joined into personal users market, IBM made a marketing model named 5530Z and sold it to a company called "Shinngaku-sha" ( seemed to be a company worked for educational field ) in Nov. 1998. 5530Z was speced as follows. After one year of research and surveillance with 5530Z-286, IBM Japan rearranged 5530Z-286 in many ways and introduced PS/55Z 5530-Sxx which is usually described as 5530-ZSX ( and probably PS/55 5530-T was introduced together with 5530-ZSX according to the date printed on a sales brochure of 5530-T03/T06 ). 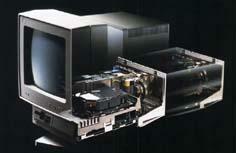 Main target of PS/55Z 30ZSX was personal market which was almost occupied by NEC with their PC9801 series. 5530-Sxx. PS/55Z Model 5530ZSX Released in Nov. 1989. PS/55Z 5530ZS is the first model of MCA 5530 series ( Except 5530Z-286 which had been sold to closed market for marketing purpose ). 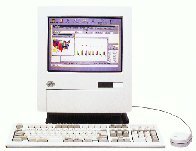 In order to reduce retail price of expensive MCA line-ups, IBM Japan picked up i386SX CPU for PS/55Z. The basic design might be derived from PS/2 Model 25Z as you can see above photo. 12" color display was built in a body. 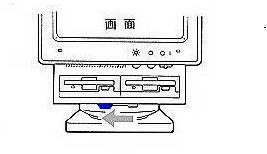 Unlike PS/2 25Z, logic unit is slide-in type ( no need to set the system up-side down while accessing system board and inner parts ). AND, PS/55Z 5530 is an MCA system. 5530Z-SX is deviled to two groups, S0x and S1x ( Ed; The former is refereed as stage-1 and the latter as stage -2 ). 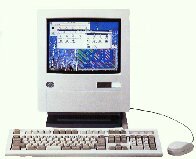 All models use 386SX-16MHz. 38F4816 : Cable, Video Signal Extension. *1: S12 was equipped with 2 FDDs. Different VRAM option P/N for Display Adapter were listed in system guide. I'm not sure if there are two variations for Display Adapter /IV. most upper slot ( Display adapter IV should be placed there ). Unscrew two knobs at the middle of rear panel. Place the connector to the "foxhole" prepared at the support guide for the connector cover. till it will stop sliding. Hold the base unit and pull it upward slightly and then slide it backward so that you can pull the base unit completely. are all same with model 5530ZSX. the model was classified to PS/55. Want to see sales brochure ? A sales brochure of 1st model of 5530-T ( T03 & T06) was dated as 11-89 which means Nov. 1989. If so, 5530-T03/06 was Introduced to the market together with 5530Z-SX in Nov. 1989. Next models, T02/T04/T08, were introduced in OCt. 1990. 486BL2-66 upgrade sub-board from Kingston was available. 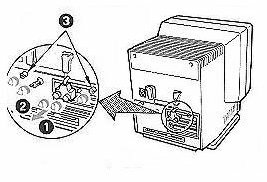 To use this parts, an interposer which changes the position of pin #1 is required. Not sure for 486BL3 upgrade by Evergreen if it could be fit in the planar. 12" color display ( long persistence phosphors ) was integrated into the body. 72pin SIMM socket x 3. 2MB/80ns parts is standard. One double-decked 4MB SIMM P/N 23F2165 can be used. Total 8MB in combination of 2MB+2MB+4MB is the MAX on the planar according to users guide. Actually 5530-T can take 24MB of RAM in combination of 3x 8MB 80ns SIMMs on the planar. Not sure if PC DOS 7 can actually see total 24MB of RAM. I've tested JDOS5.0 + HIMEM.SYS in PC DOS 7.0 on the box but I got only 16MB of RAM reported using MEM command ( this combination works for other 486 class PS/55s ). 79F2467 8MB ; Could be usable too. ESDI ( DBA2 ) 30MB to 80MB depending on model-type. 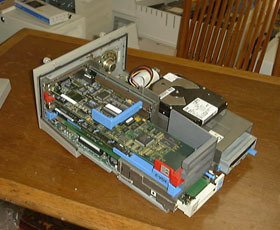 T02 was 2 FDD model and without HDD. 2 Mode drive for all models. 5530-T has only 3 MCA slots on it's riser card. 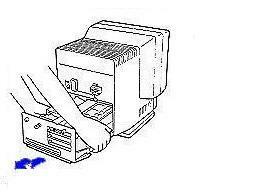 1 slot should be occupied with a PS/55 Display Adapter, hence only 2 slots are left for users. Version 1.50 based on DOS/V is the latest. In order to use XGA, XGA-2 and SVGA /A you need to use Ver.1. 50. The original Reference is based on JDOS and with the original version, option disks for SVGA or XGA can't be read. 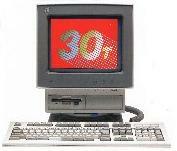 The Ref version 1.50 can be commonly used for model 5550-S/T/V, 5570-T/V, 5540-T, 5545-T.
PS/55 Display Adapter IV ( 512KB VRAM; Optional 512KB VRAM board was available ) was used for 5530-T and 5530Z-SX. Video cable from display unit is very short in its length and it will not reach except the most upper MCA slot where a stock AVE Video Adapter IV should be placed. IF you are planing to use XGA or any other Cirrus based Video Adapter, you have to use one of lower two slots to which the video cable will not reach. Thus you have to use appropriate video extension cable with D-sub 15pin female on one end and D-SUB 15 pin male on the other end. 38F4816: Cable for Video signal Extension is listed in Service Summary for 5530-Z. Newly designed 30 series was started with PS/55Z 5530-U. Built-in display was changed from 12" to flat type 13", planar and the BUS riser were also rearranged. 30-T/S provided only 3 MCA slots but newly designed body and planar/riser provided 4 MCA slots though dimension was almost same with the older body. 3 mode FDD ( 1.44MB/1.2MB/720KB read/write capable ) was used for all models. Video cable from display unit is longer than older models so that the cable reaches to the second slot. ( 01/UV1/UW4/UW8) 386SX20 FDD x1, ESDI HDD, XGA /A. 5530-UAx IBM 386SLC20 This model was called 30U-SLC. ( V04/V08/VJ8/VY8) IBM 386SLC20 Basically same with 30U-SLC but 30V was equipped with Japanese Display Adapter instead of XGA /A. OS/2 J2.0 was pre-loaded on VJ8 & VY8. 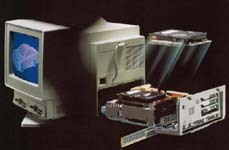 VX8/VXB IBM486SLC2-40 V28 & VA8 were equipped with a PS/55 Display Adapter/A. VX8 & VXB were equipped with an XGA-2 /A. OS/2 J2.0 was pre-loaded on VA8 & VXB. 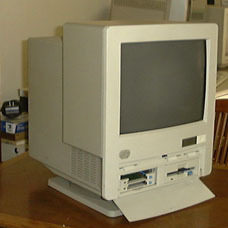 5530-V2 was the last 386 class model. U and V planar are almost same. 386SX20 on a U planar was changed to IBM386SLC20 nad J1 beside the power connector is shifted beside U1 like V2 planar below. V2 planar has aux power outlet J22. J10 on U/V planar is not seen on V2 planar . Y3 ( CPU clock OSC ) is shifted backward. I think the riser outlined left is for 5530-V2 . has silk printings as follows. Maybe it's for 5530-U/V . on the solder side of the PCB. Real 486 planar which was developed for desktop model 5550-W was used for 5530-W. Note that 5530-W is IML system. 5530-LXC 5530-L was the last model of PS/55 30 series. It's really a nice machine with a 486 class L planar and integrated 13" color display. 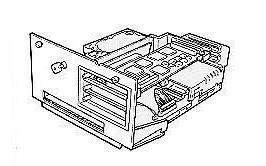 IBM 486-BL2/66 was soldered on the planar and a ZIF socket for an overdrive processor was ready on the planar. Unfortunately the socket is not PODP ready, it's a socket 1.
can make your own "5530-R" which was not released by IBM Japan. Accept ODPRDX4-100. DX4-100. Also accept am5x86 and Cyrix with voltage interposer. PODP can't be used for this model. Dimensions of the riser card are same with 16-bit card. be installed on this slot. I suppose 5530-W uses same riser card. will sit in stock condition. right bay. This adapter can be used solely in this newr 30 body. Unfortunately I don't have a front bezel to mate with this adapter. Base unit is half-pulled out. 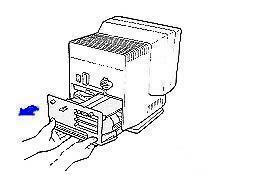 4) Short PS/2 Adapter/A for Ethernet networks with SMC chip. DSAA 720 is loaded at the HD sled. R planar with XGA-2 and 720MB HD.